The Flash takes a break from the DeVoe plot to tell a stand alone story with a really interesting idea at its core that presents a problem not easily solved. Over the past few episodes this season has become almost as frustrating as the last one. Focus on the DeVoe plot has felt repetitive and done little but show how poorly thought out the whole thing is. The show needed a break to do something else and thankfully this episode provides that. 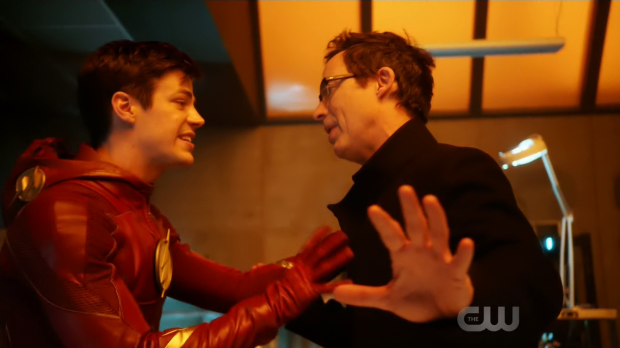 It’s addressed in the context of the episode as well with Barry in dire need of a break from the DeVoe problem because the team aren’t getting anywhere by beating their heads off a wall trying to figure out how to stop him. A diversion comes in the form of Veronica Dale (Bernadette Saquibal); an extremist bent on proving a point by destroying the city with a nuclear device. Team Flash are too late and the bomb goes off forcing Barry to enter what Cisco dubs Flashtime where he basically moves insanely fast so that time slows down to the point that it almost stops from his perspective. Since the bomb has already gone off it only really delays the inevitable but it does give Barry a chance to save the city. The villain is not important at all other than getting the plot moving but in this case it doesn’t matter. On a conceptual level this episode is fascinating; borrowing from The Twilight Zone episode “A Kind of a Stopwatch” in many ways. The idea of a looming tragedy that can’t be stopped as Barry is cut off from his support system because they can’t move as fast as he can creates a lot of dramatic possibilities and Flashtime as a concept is a great one albeit with some problems that I’ll come back to. This episode does a great job with the characters. Grant Gustin delivers an excellent performance portraying increasing desperation and fatigue as the episode progresses. Barry starts off somewhat hopeful but that diminishes as it becomes clear that he doesn’t really have any options. By the mid point of the episode Barry is desperate and struggling to maintain his speed. Sheer force of will keeps him from slowing down because as soon as he does the city and everyone he cares about will be wiped out. This isn’t a one man show as Jesse and Jay are along for the ride. Broadly speaking their contribution to the plot is minimal other than giving Barry people to interact with consistently within Flashtime. This is one of those rare occasions where throwing more Speedsters into the mix isn’t a bad idea. The absence of Wally is definitely felt here. Even though he’s on another show this would have been a good opportunity for him to contribute meaningfully to the show and would have allowed for some closure on his relationship with Jesse. I really enjoyed seeing Barry, Jesse and Jay interact. They are all really clever people so it was good to see them approach the problem as scientists and try to figure out a solution. Jay is the one to point out that their biggest barrier here is energy and all they need is an equal or greater amount of energy to cancel it out. Unfortunately they have limited ways of generating that energy so the theoretical side is fine but the practicalities don’t work. Jesse thinks that if all three of them hurl lightning at the same time it might be enough to stop the explosion but Jay’s age catches up with him and he’s unable to generate that much energy after maintaining Flashtime for so long. It’s a very simple barrier to their success that acknowledges the limitations of the characters so it’s a good way of increasing the stakes organically. 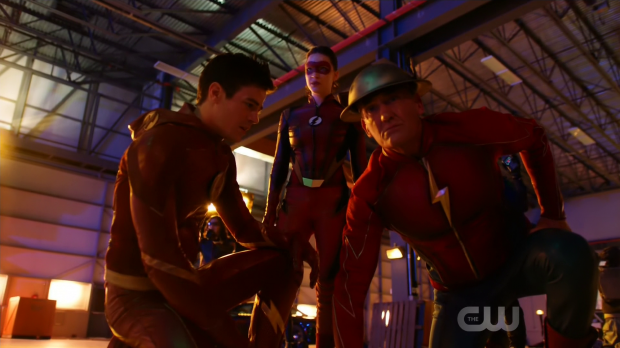 Barry has the ability to bring others into Flashtime -as seen during his trial– and makes use of it in this episode. Interestingly he’s the only one who can do it as Jesse tries and fails. It’s a handy ability for dramatic purposes as it allows Barry to have a single key scene with most of the other characters as well as try out different methods of stopping the city from being destroyed. The ability is for temporary use only as anyone Barry uses it on quickly becomes exhausted due to their bodies not being equipped to move at that speed. Adding in a consistent limitation to a particular ability is something this show rarely does well. Cisco is first up but is unable to form a breach to remove the problem entirely because there isn’t enough time for one to form. Limitations are good because it stops this Godlike speed that Barry can reach being used to solve every problem they have. Cisco is fascinated by Flashtime as expected and clearly outlines what is being dealt with therefore establishing the stakes. Harry has no better news but suggests that sending the bomb into the Speed Force as an option. He has no idea what it will do but seems to think that the Speed Force won’t be damaged. Whether he is just saying that to make Barry feel better about doing it is anyone’s guess but it is an option nonetheless. Harry’s biggest concern is Jesse’s safety and pleads with Barry to make sure she gets as far away from the destruction as possible. Grant Gustin’s acting in the scene with Harry is particularly strong as Barry practically pleads for answers that can’t be delivered. Killer Frost is enlisted to try to freeze the explosion in an attempt to stop it but her issues accessing her powers are similar to Cisco. When combined with the overall fatigue caused by moving faster than she is meant to then she isn’t much use in finding a solution. There is forward movement on the duality to Caitlin as a character when Killer Frost expresses concern for her wellbeing and this is apparently remembered by Caitlin. The approach to this character has been very problematic this season so it feels as if the writers are artificially throwing in milestones that are supposed to have some meaning and failing. There hasn’t been enough work done on the Caitlin/Killer Frost dynamic to make me care about what they’re doing with it so this doesn’t work for me. Barry’s Flashtime conversation with Iris is pretty much the same conversation they always have with nothing interesting to speak of. Grant Gustin breaking down as Barry admits he can’t save the city this time works really well even if the dialogue between them is contrived. They talk about their feelings and Iris somehow comes up with the idea of how to stop the explosion in its tracks. It feels contrived though does lead to an impressively colourful and tense sequence where Barry tricks the Speed Force into supplying the right amount of energy to stop the explosion. 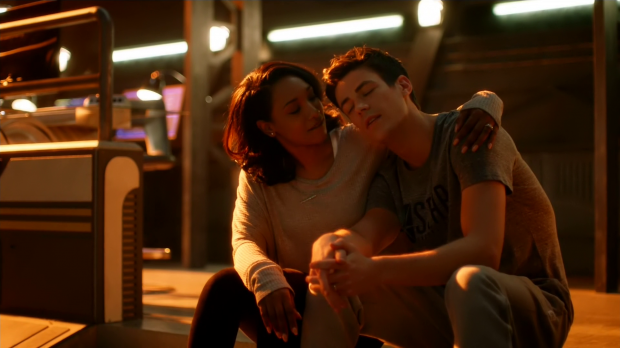 This episode does make the Barry/Iris relationship feel more genuine than it previously has. Their conversation about never having enough alone time feels like a relatable couple problem and their approach to it makes use of dialogue that more or less comes across like something people would actually say to one another. It’s a rare moment of reality in this underdeveloped connection and is certainly welcomed. It’s a shame that Barry and Joe don’t get to share a scene and unclear why this doesn’t happen especially considering their interactions are often the best this show has to offer. Another relationship dealt with is the fractured Father/Daughter relationship between Harry and Jesse. Up until this point we’ve only heard Harry’s side of the story and therefore felt sorry for him because Jesse cast him out of her team on Earth-2 and appears to hate him. Jesse adds further depth to that by explaining that her major issue is his inability to deal with her mother’s death. 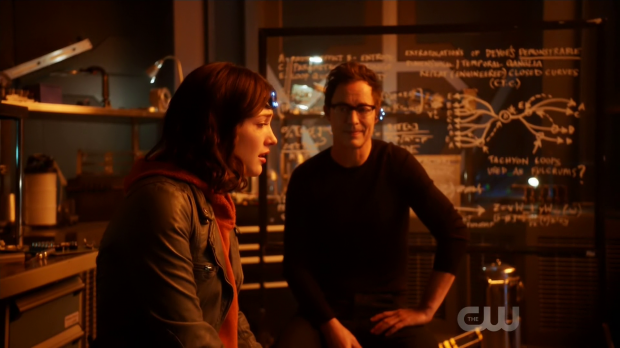 It does come somewhat out of nowhere but Tom Cavanagh and Violett Beane completely sell their scenes together. In particular the final scene where he lets her hear his thoughts so that she is better equipped to understand what he’s going through is really touching. They’ve reached a greater level of understanding through their interactions in this episode which might signal Harry’s eventual return to Earth-2. It certainly seems like his mind will be cleared enough to tackle the DeVoe problem in a different way. The mysterious young woman played by Jessica Parker Kennedy makes another appearance, this time spilling coffee and talking about being nervous about meeting a group of people. It turns out her nerves were over meeting Caitlin and Harry. This particular plot is becoming very tiresome because her appearances never amount to more than reminding us that she exists and knows the characters somehow. Nothing is developing so all of her appearances are exactly the same. I wonder if she has something to do with the female Speedster that Jay is training to replace him. Hopefully Jay can still be around in an advisory capacity rather than disappearing completely. I mentioned above that Flashtime is concept with problems. Those problems don’t really apply to this episode as it’s an isolated case of a concept being explored but this potentially breaks the show. Not only does Barry move fast enough to make time pretty much stand still for an extended period of time he also runs even faster than that as he moves from place to place. Doing this resolves the issue he has running fast enough to enter a breach before it closes in preparation for following DeVoe into his pocket dimension. 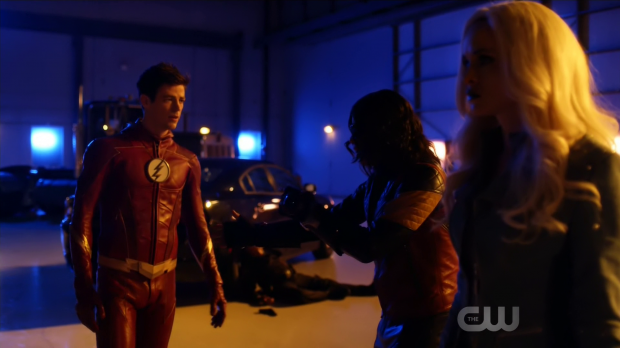 In fairness the episode addresses his acceptance of the fact that he’s more than fast enough to not worry about this but now Barry should never be late for anything nor should he ever be “not fast enough”. The speeds portrayed here are unimaginable so the show has moved him up to the level of practically instantaneous travel which will definitely create issues and inconsistencies in the coming episodes. One issue with this episode in particular is the dismissal of time travel as a solution. I understand Barry’s reluctance to travel back in time given his past experience with it but the time frame in question here is at most a few minutes. There is surely limited damage that can be done in the space of a few minutes and considering the stakes it must be worth making an exception when the alternative is the entire city being reduced to rubble and everyone in it being killed. Fair enough the idea is addressed showing an awareness that it is a possibility but the reasons for not doing it don’t work. A great episode that explores an interesting new concept and remains very character driven. 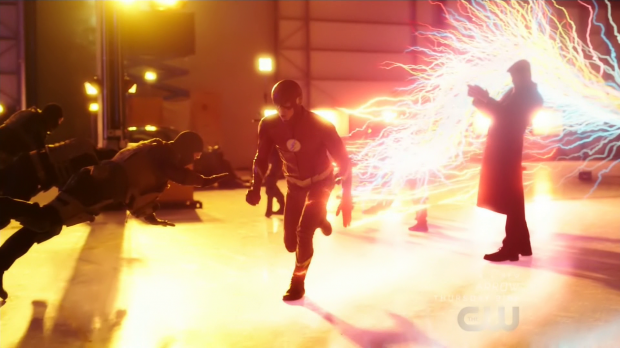 The idea of moving so fast that time appears to stand still and trying to stop the destruction of the city after it’s already happened is a really interesting one and it makes for a great character driven episode for Barry. Grant Gustin delivers an excellent performance growing more frustrated and fatigued as the episode progresses. His scene with Harry is particularly strong in showing that and the general decline in his mental state is well done. Having Jay and Jesse around makes for some interesting exchanges even if their main purpose for being there is to give Barry people to interact with more regularly. Barry shares key scenes with most of the members of Team Flash except Joe for some reason. Each of them bring something different to the table but the limitation of it being exhausting for them to enter Flashtime is well used. It cuts Barry off from his support network and increases the stakes organically. The episode also features strong interactions between Jesse and Harry who patch up their relationship and discuss the lingering issues between them. All of it comes from nowhere as we’ve only heard Harry’s side of the story but the acting is really strong to the point that it doesn’t matter. Flashtime as a concept may prove problematic for the show itself but that doesn’t hurt the episode itself. What does hurt the episode is dismissing time travel for reasons that don’t work.